Allan writes: I connected my iPad to an iMac just after I bought it and put lots of songs on it. Now I need to connect it to my own laptop but I don’t want to lose the music or photos I already have on it. How can I stop it from automatically syncing? Hi Allan! 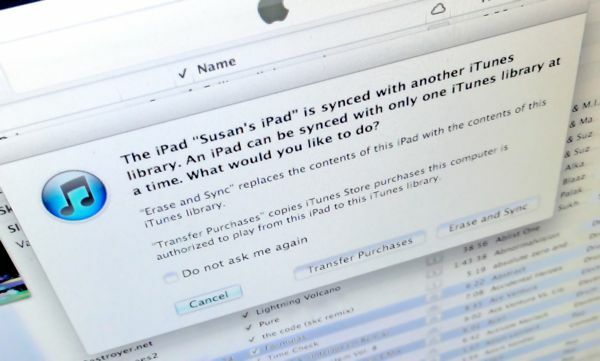 Yes, you’re right: if your iPad is already synced with iTunes on another computer, the copy of iTunes on your system will try to wipe the apps, music, photos and other goodies off your iPad the moment you connect it to your laptop. Just check the box to keep iTunes from immediately syncing a connected iPad, iPhone, or iPod. Open iTunes, click the iTunes menu (on a Mac) or Edit (on a PC) in the top-left corner of your screen, then select Preferences. Now, when you connect your iPad with iTunes, your iPad will appear in the left column of the iTunes interface, under the Devices heading—but nothing will get synced. You can also go ahead and click the “Info,” “Apps,” “Music,” “Movies,” “TV Shows,” and “Photos” tabs along the top of the iTunes window, and you’ll notice that none of the “sync” options (such as “Sync Apps” or “Sync Music”) are checked. If you do check any of those “sync” boxes, iTunes will again warn you that it will wipe the relevant content from your iPad before proceeding. Of course, you could always re-download any apps, music, or other items that you’ve previously purchased from iTunes. But songs, snapshots, or anything else that didn’t come from the iTunes store will be erased for good. If your iPhone or iPad is already synced with an iTunes library, iTunes on another system will try to wipe your content before it begins syncing. When it comes to your music and photos, you’ll need to get them off your iPad before trying to sync with iTunes—and for that, you’ll need the help of some third-party applications. Lifehacker has a handy list of programs that will copy music from an iPad, iPhone or iPod to your desktop. My personal favorite is Senuti for Mac ($19, or free for a limited demo version), which lets you pull tunes off any iDevice in just a few clicks. Once you’ve copied your music to your laptop, you can then drag all your albums into the iTunes interface, then (once you’re ready) check the iTunes “Sync Music” box. And what about your photos? The good news is that iTunes won’t erase any photos sitting in your iPad’s camera roll, even if your iPad is synced with another photo library. The bad news? Any other photos in your iPad’s photo library (including those synced from another system) will get erased, unless you back them up first. An easy (and free) solution I found in the App Store is called WiFi Photo Transfer, an app that lets you wirelessly transfer any and all images from an iPhone, iPad or iPod to a nearby PC or Mac, so long as both devices are connected to the same local Wi-Fi network. What about apps, contacts, and other content on your iPad? In general, the same rules apply. Click, say, “Sync Apps,” and iTunes will erase all the apps on your iPad and replace them with the apps stored in iTunes. 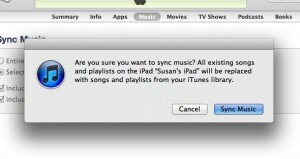 Keep in mind, though, that you can always sync some items through iTunes and not others. For example, you could sync your music and photos while keeping the “Sync Apps” or “Sync Contacts” boxes unchecked. And remember, you can wirelessly back up most of your iPad data, including items that aren’t synced with iTunes, with a free iCloud account.